Composite dust from a grinding and sanding operation on automotive parts. 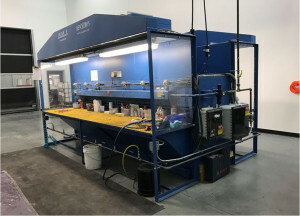 A Double-sided Benchtron downdraft table which enables two workers to simultaneously sand and grind composite pieces. Worker productivity in that area increased due to two people being able to work in tandem. Rework on other parts in the area was dramatically reduced due to the source capture of the composite dust rather than having the dust migrate throughout the plant. The customer has been very enthusiastically singing the praises of the Benchtron and will be purchasing more very shortly to control their dust problem.